Rohit scored 133 in the 1st ODI against Australia but this incident stood out for quite a few fans. Indian opener Rohit Sharma generally is a serious player on the field. When he authors his innings – most of which are gigantic ones – not many expect to see anything comic. But on Saturday, as the batsman was playing a smashing 129-ball 133 while chasing a steep target of 289 against Australia at the Sydney Cricket Ground, there was an instance involving him that left the fans in splits. Even the Indian supporters who were otherwise dejected with the 34-run loss, could not hide their amusement. It so happened that the batsman lost his balance and fell over the stumps while completing a run and the clips that came out looked hilarious. One footage from the rattled timber camera showing Rohit’s lower part even exuded a funny reaction from a fan who said the BCCI would now ban the cricketer for posing inappropriately in front of the stump cam. One doesn’t need to learn rocket science to make out who were being targeted by the jibe. 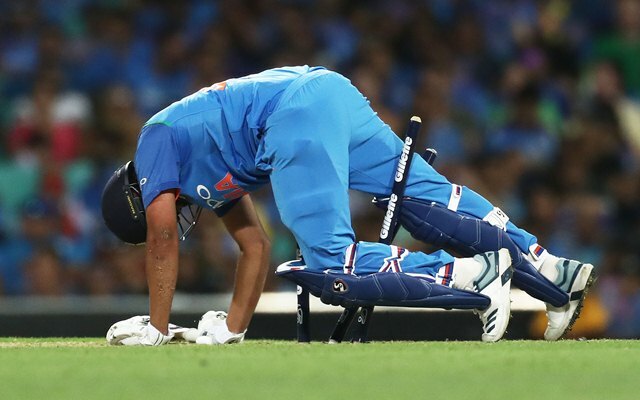 Another footage of Rohit’s tumble also left the social media in splits with one saying it reminded of the legendary Pakistani batsman Inzamam-ul-Haq who had once tumbled over his stumps to get hit wicket. Rohit though was not as unfortunate. Rohit kept India in the hunt single-handedly after the visitors had a disastrous start, losing three wickets for four runs. He added 137 runs with wicketkeeper Mahendra Singh Dhoni (51) but the latter’s batting was too slow to increase the pressure towards the end. Rohit himself fell to a tiring shot in the 46th over, ending India’s hopes as they finished at 254 for 9 in 50 overs. It was Rohit’s 22nd ton in the ODIs that saw him equalling former India captain Sourav Ganguly and he is the joint third highest century-getter for India in the 50-over format after the legendary Sachin Tendulkar (49) and current captain Virat Kohli (38). Rohit hit 10 fours and six sixes en route his 133, his fifth hundred in Australia in ODIs. Reminder of Inzi the legend!